The UR-Sweden library sub programmes has set as one of its goals to create a new website, which will serve as one common entry point to UR library services and resources and at the same time provide information about specific campus libraries. 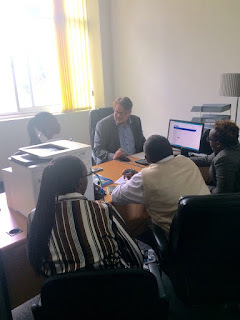 A website group, chaired by the university librarian and team leader Dr. Robinah Namuleme, was trained by teachers from SSLIS at several occasions in 2016, and have been working in collaboration with the Swedish partners on the structure and content of the website. Between the 6th and and the 8th of February 2017 the group, together with the main teacher Tuve Nordius and Veronica Trépagny (team leader), work with finalizing the web site up to a degree where we feel we will be able to share it with the university community and library users. Work with development of the website will continue, since all content is not yet in place (discovery tool, shared catalogue and institutional repository, for instance -- those are processes that run alongside this one). Béatrice Niragire, Benilde Mukarubayiza, Tuve Nordics, Alphonse Ngambonzima and Anonciatte Umutesi working on the website. The group was also joined by Antoinette Kankundiye.